From the original 16th century glassworks, to one of the world's premier crystal factories the story of the Cristalleries de Saint-Louis is told in this fascinating narative which spans the centuries. Gérard Ingold has lived much of this story and tells it well; Glassblowers and cutters are the pricipal actors, working with glass. With simple tools, the blow- pipe. paddle, shears, the cutting and buffing wheels - with their hands they give life, form and light to glass, in a scintillating ballet, for which the blowing room and the cutting shop are the theater. The story of Saint-Louis is the story of the French crystal industry. 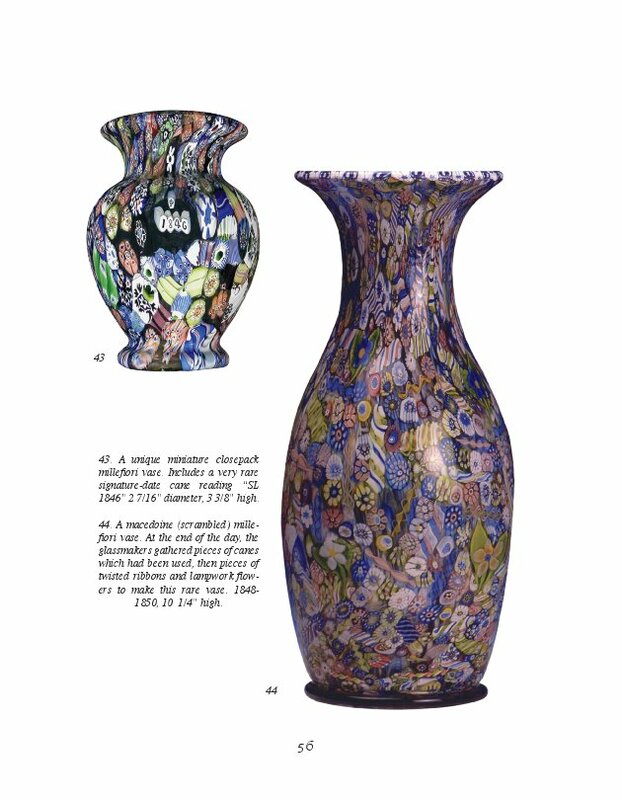 From simple industrial glass to stunning works of art in crystal used and collected by presidents and kings, the history is here. so too are the objects, from small tumblers to giant candelabra almost 15 feet high. Having devoted his career to Saint-Louis, Gérard Ingold knows his subject well. He was a friend of Jean Cocteau, Collette, Sacha Guitry and Paul Jokelson. He worked with famed artists and designers such as Victor Vaserely and Raymond Loewy. He was influencial in helping revive the dormant art of making fine paperweights at Saint-Louis and instigated encasing gold medallions, both art forms dear to his heart. Take a peek inside, as Gérard opens the Saint-Louis archives, guides us through their museum and gives us access to the blowing and cutting room floors. 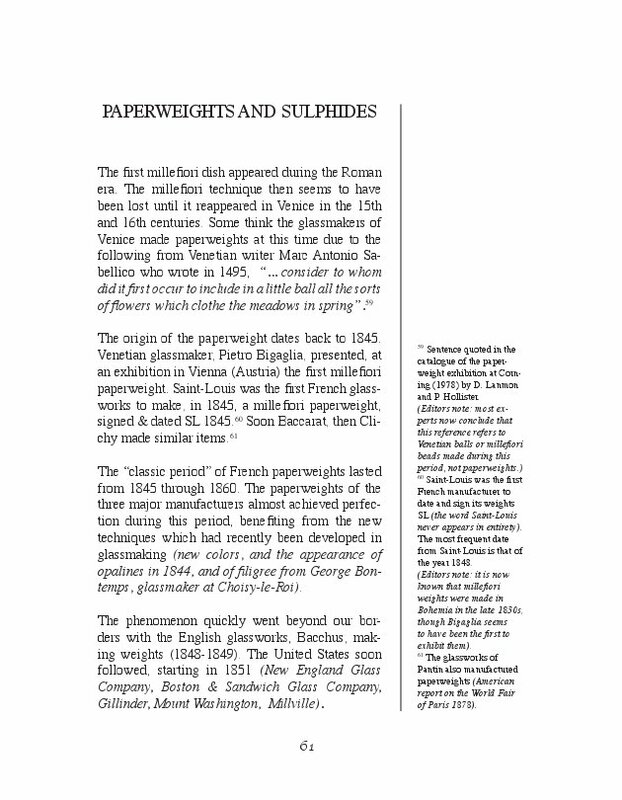 preface by: Yvonne Brunhammer, Head Curator of the Museum of Decorative Art. The founding of Saint Louis, in 1767, on the site of an old glassworks dating back to 1586, is related to the history of Lorraine, where we find the valley of Muntzthal, and all of the ingredients necessary to make glass; “wood from the forests,” “sand from the sandstone earth,” “salt from the high Sarre” and “potash extracted from fern ashes”. That was added to a glassmaking tradition which goes back to Gallo-Roman times, and the economic interests, when Lorraine was attached to France with the death of Stanislas Leszczynski, when Louis XV, King of France, conceded to Rene François Jolly the privilege of founding at Muntzthal, a glassworks which would bear the title of Royal Glassworks and the name of Saint Louis in memory of Louis IX, King of France. Louis XV was mainly concerned with repopulating the valleys of the County of Bitche and putting its royal forests to good use. It is this history, told in Gerard Ingold’s book in so erudite and lively a way, that one begins to think that he lived it himself. And in a way he has, when one knows of the years he has spent in the service of Saint Louis, and of his interest in all the aspects of the everyday life of the company—the creative and manufacturing process in which he took part, his patience and passion in consulting the archives, the catalogs, the documents and the objects themselves, preserved in Muntzthal and distributed in museums and collections throughout the world. 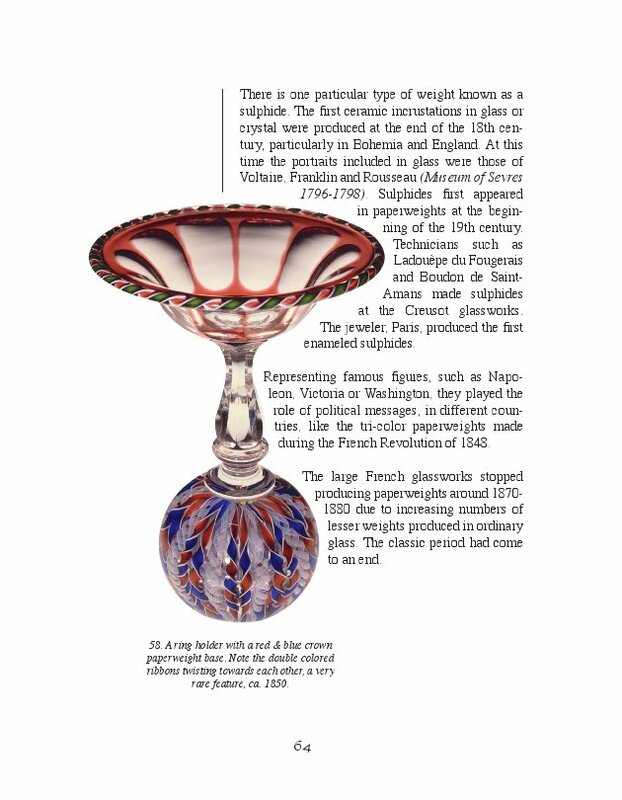 In 1783, Gerard Ingold tells us, Saint Louis was manufacturing window glass, goblets and crystal. Once past the difficulties of the revolutionary period, (aggravated by the fact that Bitche was in the middle of the battlefields of the late 18th century wars), work began again under the Consulate, and Saint Louis was able to take part in the first Exhibition of the products of French Industry, in the Champ-de Mars, in 1798. This exhibition was organized by François de Neufchâteau, Minister of Industry, who thus tried to revive the “products of industry” by rehabilitating them, and to break the hierarchical division between the fine arts and the decorative arts. Another crystal workshop exhibited there at the same time, the old Crystal Manufacturing Company of the Queen, transferred from Sèvres to Creusot in 1786. Baccarat lit its first furnace in 1819, under the direction of D’Artigues, a former director of Saint Louis. If we were not already convinced that the 19th century was the golden age of crystal, Gerard Ingold’s book would undoubtedly persuade us. Saint Louis played a central role in the extraordinary development of this material, whose secret magic is revealed through various technical and decorative innovations. One of the first of these was the development and the control of color, with objects either colored, or overlaid with one, two or even three layers of color. Then, in 1844, came the discovery of crystal opalines. 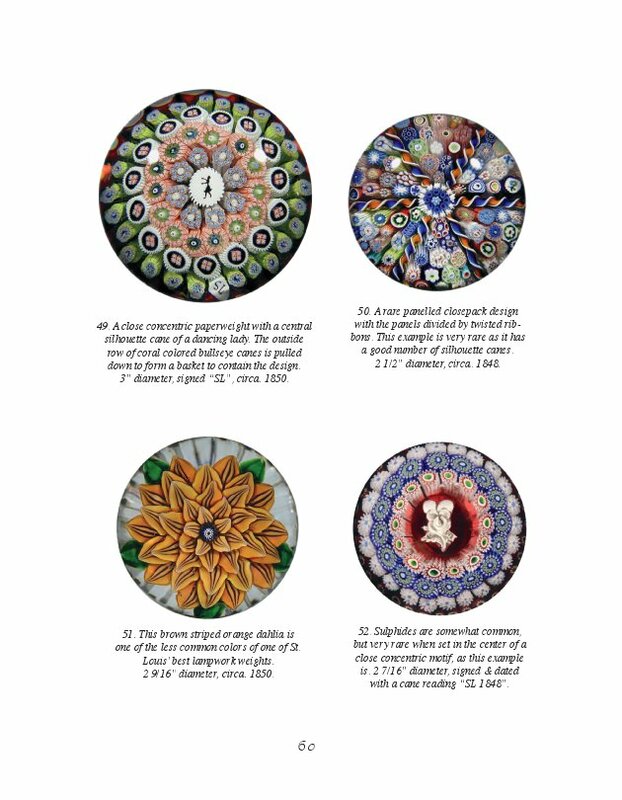 The following year, in the Muntzthal workshops, the first millefiori paperweight, in the Venetian style1 was produced, starting a fashion which quickly went beyond the French borders, only to disappear just as rapidly during the years 1870-1880. The popularity of these objects at the beginning of the 20th century, when they become collector’s items in the United States, England, then in France, appreciated by some of the great ladies of literature and the fashion world—Colette, Jeanne Lanvin—stimulated Saint Louis to again begin their manufacture. 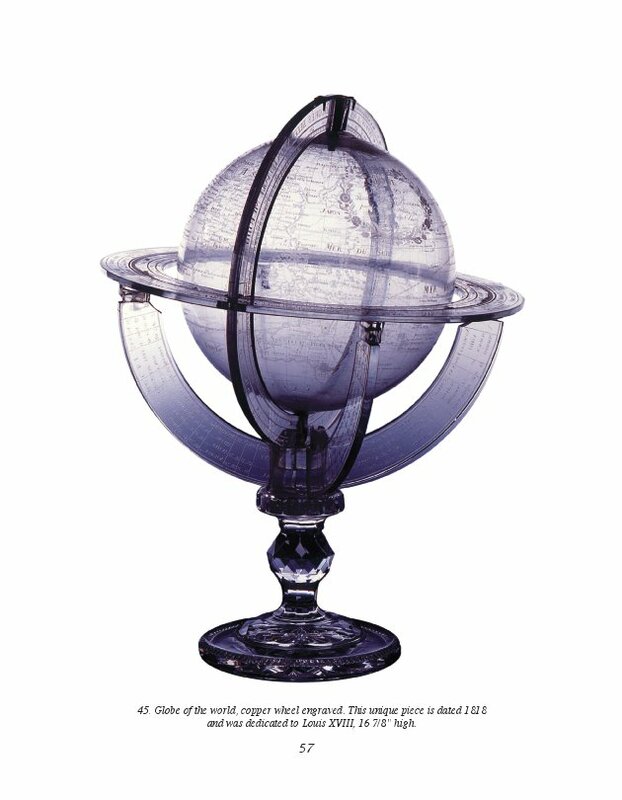 As the technique of molding, still being used, had little future, it was soon replaced by other techniques, such as engraving and cutting, which emphasized the unique qualities of crystal. Crystal was now entering the apartments of the middle-class, newly enriched by the industrial prosperity at the end by the reign of Louis-Philippe. They were buying wine services, now being used on the table, and numerous decorative objects to fill their apartments; in the stores which were proliferating in Paris, and in the provinces, following the example of Le Petit Dunkerque and the L’escalier de Cristal. Beginning in 1851, the World Fairs replaced the Exhibitions of the Products of Industry which had been repeated during all of the first half of the 19th century in France, but which had been limited to national manufacture. 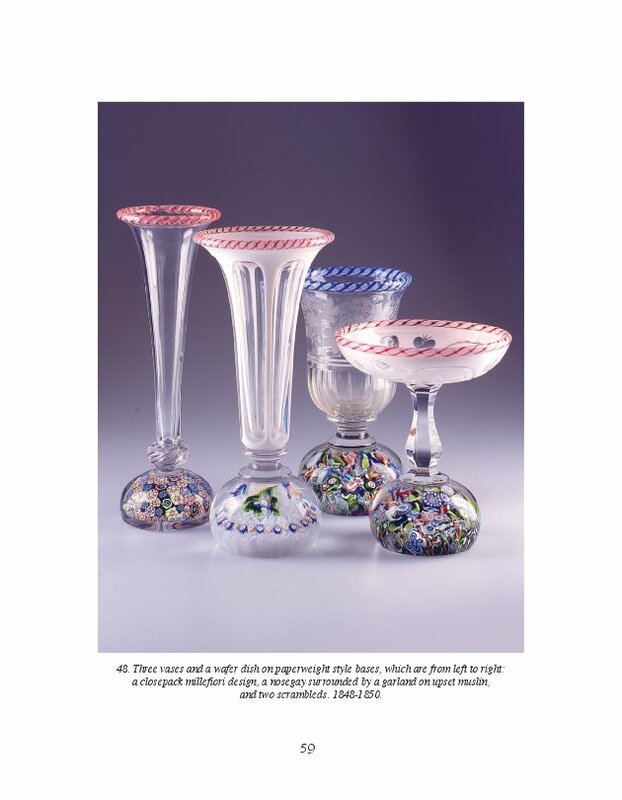 The great industrial celebrations, which were the World’s Fairs of Paris in 1855, then again in 1867, gave theopportunity for Saint Louis to present itself as a modern industry, open to advanced techniques, and having a diversified production: “Among the new techniques presented by Saint Louis should be listed: marbled glass imitating malachite, ruby glass in the style of Bohemia, “luftglas” (a transparent mass encasing threads of enamel in the form of rhombuses) and “flechtglas” (filigree glass) as well as imitations of colored fruit.” Saint Louis exported half of its production throughout the world, from the United States to Russia, to the Indies and Nepal, to Egypt and South America. From this period we have invaluable catalogues published in English, German, and Spanish, which allow us to date this production. 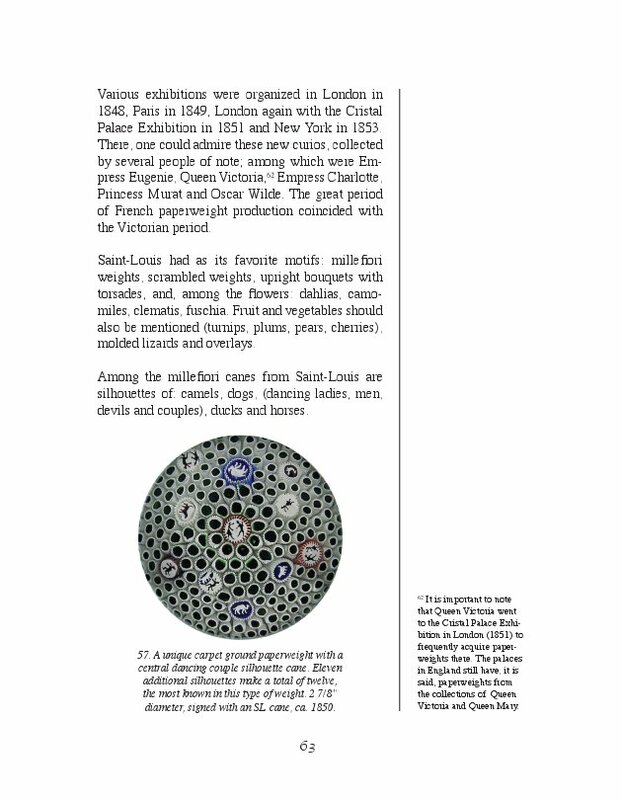 It seems difficult to imagine that the Saint Louis company also produced industrial glass, from 1877, manufacturing oil lamps for the mines and lanterns for railway compartments. This is not the image traditionally associated with crystal or with Saint Louis. However, the company operates on different levels, using chemical engraving, but also an abundance of gold. 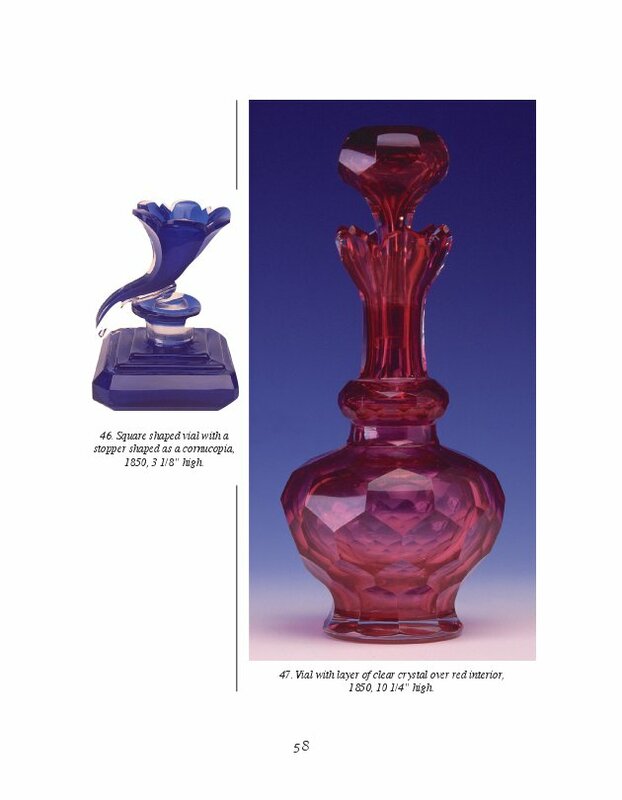 When Art Nouveau coincided with a renaissance of art glass, favoring its development, Saint Louis produced a series, in the naturalist style popular during that period, signed d’ Argental. 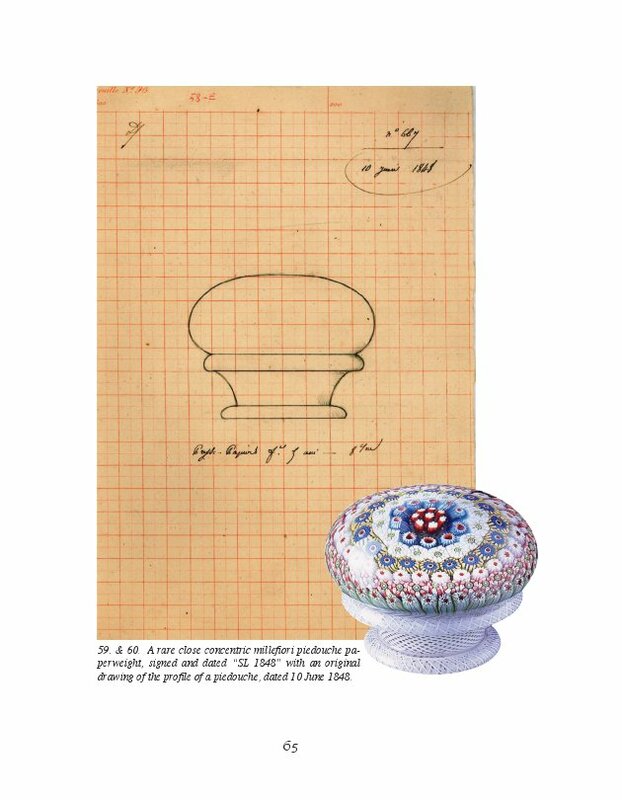 But the turning point for crystal, in the 20th century, came in the Twenties when it called upon glass artist Jean Sala, who knew better than anyone how to emphasize the optical qualities of crystal, and when it asked Jean Luce, Maurice Dufrène, Marcel Goupil and Max Ingrand for designs. Gérard Ingold, a Director of the Cristalleries de Saint Louis for thirty years is a prize winning author of the Académie Francaise. He is the author of numerous books on glass, and a history of World War II. He calls himself a son of the American Revolution—one of his ancestors, a general, took part in the battle of Yorktown in the American war for independence. "Having devoted his career to Saint-Louis, Gérard Ingold knows his subject well. He was a friend of Jean Cocteau, Collette, Sacha Guitry and Paul Jokelson. He worked with famed artists and designers such as Victor Vaserely and Raymond Loewy. He was influencial in helping revive the dormant art of making fine paperweights at Saint-Louis and instigated encasing gold medallions, both art forms dear to his heart. Take a peek inside, as Gérard opens the Saint-Louis archives, guides us through their museum and gives us access to the blowing and cutting room floors." preface by: Yvonne Brunhammer, Head Curator of the Museum of Decorative Art. 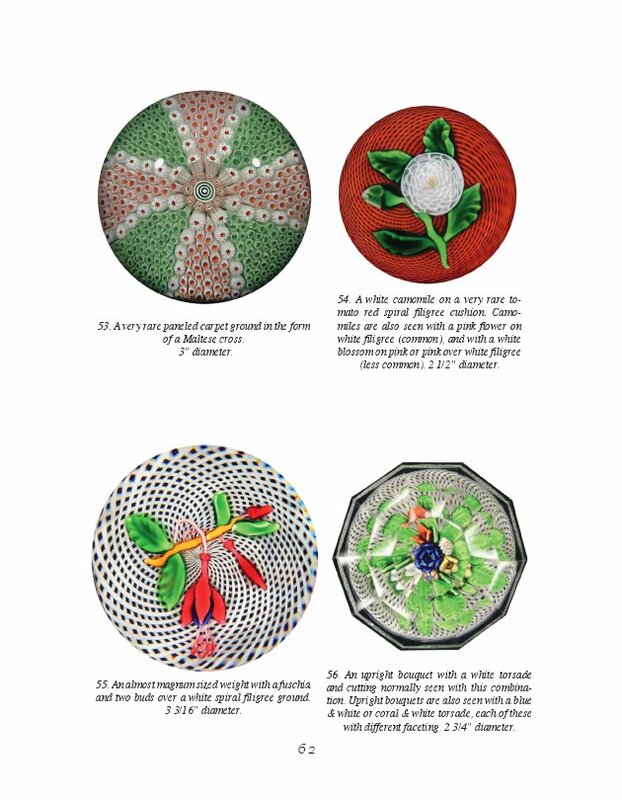 Also by this author, with Paul Jokelson, Paperweights of the 19th and 20th centuries, published by Papier Presse.